Want to organize your own ‘pun pa’ party? ‘Pun pa’ is one of my all-time favorite comfort foods. Growing up, I loved helping my mom dice the veggies and organize the spread of fresh and colorful herbs. The aromatic smells itself gets my taste buds dancing. If you’ve ever gathered around a Lao cook making pun pa, you would notice the endless array of prep work needed to make this food affair happen for eager eaters. Keep in mind the key word for ingredients: fresh, fresh, fresh. The Lao tend to go to great lengths to ensure that every part of a pun pa party has the right ingredients and only the freshest vegetables. After all, this is one of the only few Lao dishes that actually promotes families and friends to gather around a ‘pa kao’ (bamboo table) to eat together in a community-like setting. -Fried tilapia. Or any fish/meat of choice. Just remember: if you want your life made easier, make sure to not use the fish with a ton of bones. -Vermicelli rice noodles. Fully cooked, cooled, and separated. -Cabbage/lettuce. Traditionally, cabbage is used, but iceberg lettuce or butter lettuce are easier and less bitter wrapping alternatives. -Veggie & herb tray: roasted peanuts, cherry tomatoes, cucumbers, sweet basil, green onions, lemongrass. These are generally the base ingredients but you can choose to add in dill, long beans, Asian eggplant or anything else to your heart’s desire. –The pun pa dipping sauce aka ‘jeow mak kham piak’ (tamarind spicy sauce). This is typically the sweet, spicy, and extra pungent sauce. There are different variations and everyone has their own preference, usually depending on which region of Laos you’re from. Using a mortar, smash up a few garlic cloves, lemongrass, red peppers and add in tamarind sauce, fish sauce, and padaek juice. Optional: my mom puts in puffy pork rinds for an extra crunch. If I could have the freshest catch from Laos, I’d eat fish every day, because it’s amazingly delicious, but if you’re in the US like me, you’ll find some pretty good choices at your local fish or seafood market. Just ask for the the latest catch. Whether it’s seabass, red snapper or even shrimp, having the rest of the ingredients will sure make it a pun party. Oh, and don’t forget the napkins for the drippy jeow sauce. You don’t want to go around smelling like you took a dip in padaek heaven. Unless you’re all about that. 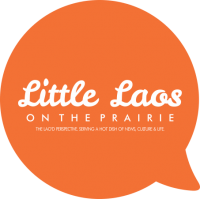 Happy summer eats from LLOTP! Mmmmmm… I love it too. I dislike to prep because like you said, “endless array of prep work”. Mmmm! If it weren’t for all the prep work (for most all Lao meals), I’d honestly make it more. <— sh*t I say to my white husband.